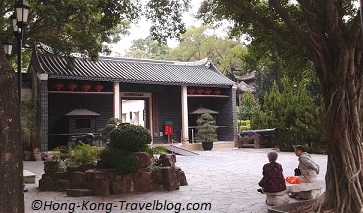 The Kowloon Walled City Park is a park designed in Jiangnan garden–style in Kowloon City, Hong Kong. 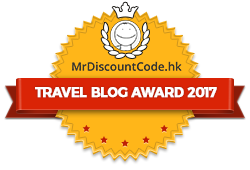 It is located in the historical site of the mysterious Kowloon Walled City. The Walled City was in theory an enclave of the Chinese government throughout British colonial period in Hong Kong. The site of the Kowloon Walled City was a military outpost of the Chinese government which had been used by imperial officials since the 15th century or earlier. It was fortified during the Qing Dynasty (1644–1912), and a walled garrison-city was built after the British occupation of Hong Kong Island in 1841. The Kowloon Walled City became an enclave of the Qing government after the New Territories were leased to Britain in 1898. Years later, the stone walls of the City were demolished by the Japanese army during World War II. After WWII, its population increased dramatically. The Walled City became a slum notorious for its Triads, gambling, prostitution, drug and quackery. It was known as a “limbo zone” of the Hong Kong government, the British government and the Chinese government as neither of them wanted to do anything during 1950s to 1970s. Besides, domestic factories like textile, food and fish-ball making flourished in the City. It was believed that almost 80% of fish-balls in Hong Kong were made in the City. 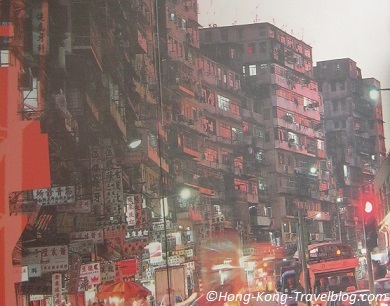 Until 1987, Kowloon Walled City demolition was announced by the Hong Kong government subsequent to the agreement of the Sino-British Joint Declaration in 1984 regarding the handover of Hong Kong in 1997. The Walled City contained 33,000 residents within its 2.6-hectare (6.4-acre) borders by 1987, and the number of buildings was 503 in 1994, which made it one of the most densely populated places on earth (click here to view more photos of the Walled City). The demolition began in 1993 after all the residents were resettled. The site has been transformed into the present Kowloon Walled City Park and was opened for public in 1995. Designed as a Jiangnan garden of the early Qing dynasty, the 31,000 square metres Kowloon Walled City Park is divided into eight scenic zones with individual landscape features. Some of the remains are preserved and artifacts are displayed. The most significant remains are the Old South Gate and the Yamen. South Gate was the main entrance of the Walled City. 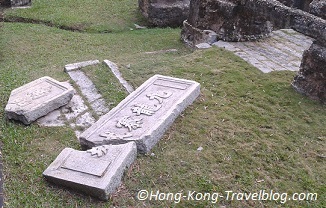 The most important relics are the two large granite plaques engraved with the Chinese characters for “South Gate” (南門) and “Kowloon Walled City”(九龍寨城). Other relics include the remnants of the wall base, flagstone pavement, cornerstones of the buildings a drainage ditch and couplets etc. The original site of South Gate has been designated as a declared monument and all related relics were unearthed when the Walled City was torn down in 1994. Built in 1847, the Yamen is the only remaining building of the Walled City. It was once the offices of the Qing officials. After 1899, it was used for charitable purposes like home for the elderly named Almshouse. It is now a declared monument in Hong Kong. Yamen has three rows and four wings of houses, historical information and artifacts of the Kowloon Walled City are displayed. In addition, the two front cannons which were casted in 1802 are the only remaining in Hong Kong. The exhibition, a City of Thousand Faces, consists of one Outdoor Display Area and six Exhibition Rooms inside the Former Yamen. Opened to public in 2009, the exhibition recreates the old days of the Kowloon Walled City through models, images and sound effects etc. The Outdoor Display Area is located near the South Gate which showcases a shadow wall and a bronze model of the Kowloon Walled City. Scenic zones other than the South Gate and the Yamen includes: the Garden of Chinese Zodiac, the Chess Garden, the Garden of Four Seasons, Eight Floral Walks, Guibi Rock and Fui Sing Pavilion and the Mountain View Pavilion. 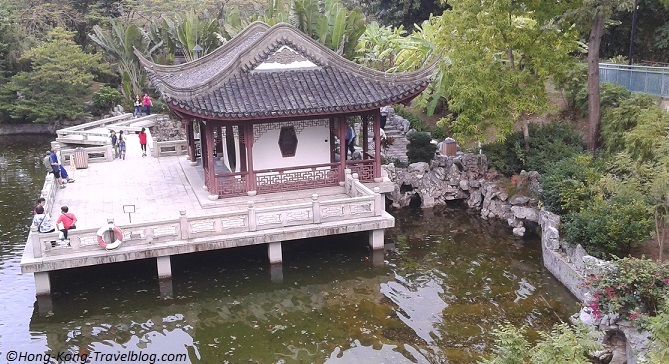 They are good places to enjoy the beauty of nature and the Chinese architecture. The cultural depictions of Kowloon Walled City’s architecture, culture and social phenomenon are scattered all over the world in various forms. It is perceived as the representative of overcrowding, poverty and crime. Many authors, game designers and filmmakers have included the Walled City in their works. For example, it was featured in Jackie Chan’s film “Crime Story” in 1993. A video-game arcade near Tokyo in Japan that recreate the milieu of the Walled City was opened in 2009. The park is open from 6:30 am to 11:00 pm daily. The exhibition rooms open daily from 10:00 am to 6:00 pm every day except on Wednesday. MTR Lok Fu Station Exit B, then take a taxi to Tung Tau Tsuen Road or walk along the Junction Road for 20 minutes. Bus– Take the Bus 1 from the Tsim Sha Tsui Ferry Pier Terminus. Get off at Tung Tau Tsuen Road (opposite to the park). Are you planning to visit the Kowloon Walled City Park? Have you got any incredible experience with the Walled City? Thank you for reading this post. Please like us on Facebook and share our post! Feel free to write some comments and contact us if you have any questions.